Trigger Warning: This post includes math. If this causes you anxiety, you may want to go browse through some of our other posts instead. One of the lessons we’ve learned in the over 5,000 nautical miles we’ve traveled since embarking on our Life On The Hook™ is how reliant we are on our engine to get around. While we may live on a sailboat, we don’t really do that much sailing, because of the wind’s uncanny ability to always blow too much, too little, or from exactly the wrong direction. If we relied on the wind alone to get where we wanted to go, we’d probably spend months waiting for just the right conditions, or it would take five times longer to get where we were headed. I’d say we spend roughly 80 to 90% of our time underway either motoring or motor sailing. It always surprises new cruisers when we share this lesson with them, but whenever we catch up with them further down the line, they usually admit we were right. Being as reliant as we are on our trusty little Yanmar diesel, you can imagine how unfortunate it would be to run out of fuel. We always keep a close eye on our fuel tank level, and a big part of planning for any passage is making sure we have enough fuel onboard to motor the entire way if necessary. It only provides a rough estimate of the level in our tank, probably plus or minus 25%. We’ve learned that we can be down six to eight gallons and the gauge will still say full, and when we’re underway and the boat is rolling, it will swing wildly over half its range. It also hits empty long before we are critically low, causing needless anxiety. How does the engine hours meter tell us how much fuel we have onboard? It’s really very easy. It all comes down to knowing our burn rate, or how much fuel our engine uses in an hour. When you know your burn rate, you can multiply that by the number of hours since your last fill-up to determine exactly how much fuel you’ve burned, and thus how much you have left (because you know how many gallons your fuel tank holds, right?). So how do you determine your fuel burn rate? To get a rough estimate, you just fill up your tank, run the engine for a while, and then fill the tank back up again. 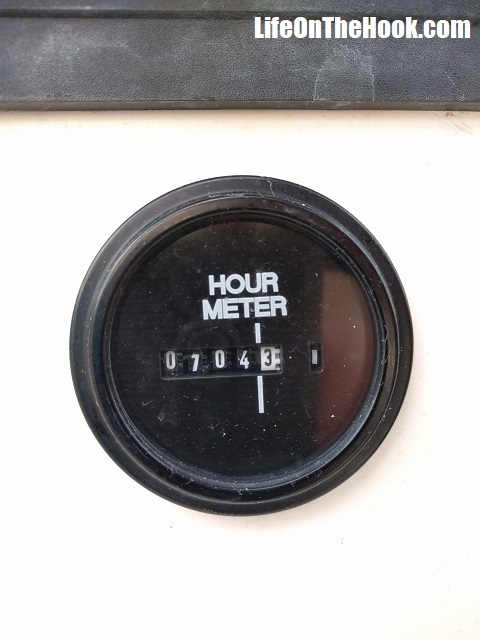 Now divide how many gallons it took to fill up the tank by the number of hours you ran the engine, and you’ll get an answer in gallons per hour. This is your burn rate. Do this several times and average the results, and you’ll get an increasingly accurate estimate of your actual number. In our case, the year or so we spent sailing our local waters around Pensacola gave us an estimated burn rate of .6 gallons per hour. Now this rough estimate was fine for ensuring we’d never run out of fuel while sailing our local waters, where we had numerous places to refuel. 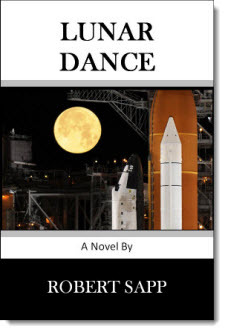 But when we started actively cruising, actually crossing oceans and traveling to remote places where there were fewer opportunities to refuel, we wanted to have a more precise number. That’s where a fuel log becomes vitally important. 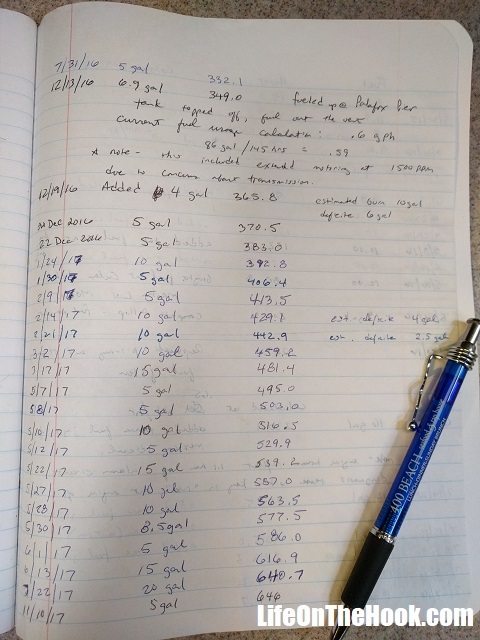 In the back of our maintenance log, we have a section in which we record the engine hours every time we add fuel, and the number of gallons added. We began the process by carefully filling our fuel tank until fuel came out the vent, which told us it was completely full. For several months of cruising, we’d log our hours and gallons whenever we added fuel. After several hundred engine hours and over a hundred gallons of fuel burned, we once again filled the tank to the vent, bringing it back to full. Dividing the total engine hours by the total amount of fuel consumed gave us a much more accurate burn rate value of .664 gallons per hour. Why go to all this trouble? Two main reasons. First, when we pull up to a fuel dock to fill up, the last thing we want to have happen is to overfill the tank, spill fuel out the vent and create a fuel spill in the marina. It makes everyone very cranky, and you can actually be fined for the environmental impact. 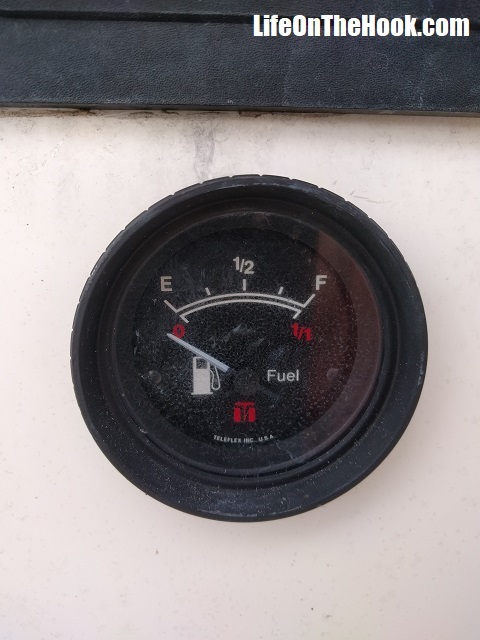 If you’ve never been at a fuel dock, you may not know that because most sailboat fuel tanks are vented, they don’t build up the backpressure necessary to make the pump automatically click off like it does when you fill the tank of your car. When the tank is full, they just keep pumping, spilling fuel out the vent. So you need to have a way to know how much room there is in your tank so you know when to stop pumping. A quick check of our fuel log and a simple calculation (engine hours since last fillup x burn rate) tells us exactly how much room there is in the tank and thus how much to pump. I’ll admit it takes a bit of discipline to keep an accurate fuel log, but the peace of mind we get from knowing exactly how much fuel we have and how far we can travel is worth the effort. The results speak for themselves. We went 11 months between complete fillups this year (i.e. fuel out the tank vent), putting 300 hours on the engine and burning 200 gallons of fuel. To completely fill the tank took 3.1 gallons more than I expected, which means our calculations were off by only 1.5%. This entry was posted in How? and tagged Calculating Fuel Burn Rate, Cruising Boat Fuel Usage, Monitoring Fuel Usage on December 23, 2017 by Robert. great post! Idea for future article: How do I setup my log books for a new (to me) boat? Great question! Unfortunately, we’re not organized enough to suggest how to set up your records. We just sort of wing it and make it up as the need arises. Some people maintain actual deck logs, recording lat and long and weather conditions every hour they’re underway. That’s way more than we want to bother with. We record major maintenance items, and document our fuel usage, fluid and filter changes and the runtime on our water maker. The only advice I can give is to get in the habit of writing it all down, and then be ready to change things once you learn how you need to sort it to support your needs.